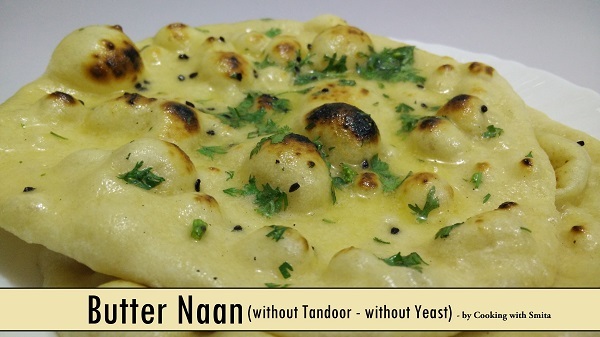 Butter Naan Recipe without Tandoor & without Yeast or Egg. Read recipe below or watch the video to know the secret trick. A butter flavoured Indian Flatbread is a super easy recipe and made on Tawa instead of Tandoor. Learn how to make the restaurant like soft, fluffy & tasty Butter Naan at home. Take All Purpose Flour in a large bowl, add Powder Sugar, Baking Soda, Baking Powder, Salt, 1 tsp. Oil, Curd and mix well all ingredients. Add water as required and prepare the medium soft dough. Cover the dough and keep aside for 1 hour. After an hour, add some oil and knead again. Sprinkle some dry flour and roll into medium size thick rounds/rotis. Add some Onion Seeds on top and press gently. Flip over the raw Naan and apply some water on another side. Place the Naan on a hot Tawa from the side where you have applied water. When you see bubbles on Naan, turn the Tawa upside down & cook the Naan on direct flame. Don’t worry, Naan will get stuck to Tawa due to water applied on the bottom. Cook till you see brown spots on top. Remove from Tawa and spread the Butter on it evenly with chopped coriander leaves. Serve hot with your favourite sabzi. wow .you are a brilliant cook dear . transparent talk and good explanation .keep it up and god bless you .